Welcome to Syria Studies, the official online journal of the Centre for Syrian Studies (CSS) at the University of St. Andrews. Syria Studies is a peer reviewed and indexed journal that has previously been published in hard form. We are proud to include on our Board of Reviewers some of the most renowned authorities on Syria. In this new issue of Syria Studies, entitled Untold Stories – Gender-sensitive readings of the Syrian Uprising, we are pleased to share two samples of a new and promising approach to analysing and interpreting the narrative of war. It is an approach that is not only preoccupied with the human dimension of political conflict, but also one that seeks to shed light on the gender-specific nuances that permeate such dynamics. Indeed, it is now widely accepted that ideas of masculinity have had a significant impact on the way in which politics is understood and analysed, often skewing our perspective of what exactly is taking place. 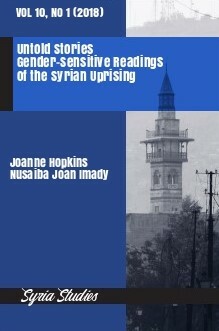 When applied to the realm of Syria studies, employing a more gender sensitive approach can help us capture the stories that are often untold, or brushed aside; stories of women and men attempting to assert their identity in a political context that is often adamant at denying them this right.